Story Time With the Library Lady: "The Nutcracker" In A Box, Or: I Think I Can Dance! "The Nutcracker" In A Box, Or: I Think I Can Dance! 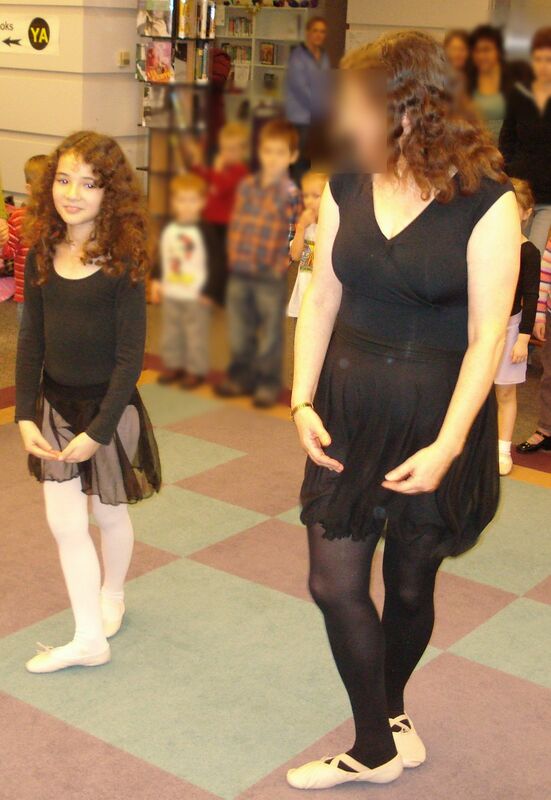 I have been a bad amateur ballerina for years--I've been taking classes for about a decade now. Not that I'm good--when you start dancing at 40, and you're not a skinny sylph, it's not going to happen. But I love it. About 6 years ago I took it into my head that it would be fun to do some sort of "Nutcracker" movement program with the kids at programs in December. I started hunting on the Net for idea, but found next to nothing to help me. Fortunately, I have my teacher and dear,dear friend Lynne, who has taught ballet to preschoolers for many years. We met, in fact, when she was a preschool teacher and used to bring her class in to my library for visits. With her help I devised several simple dances. On my own, I figured out which other pieces would be good for creative movement and came up with props to use. This has become an annual event and I've added more props over the years. The families love this and the kids seem to as well. In fact, I had a mom ask this week if her oldest son (8 or 9) could come to the after school session--he ASKED to come! Some of the props are handmade because making them is a lot less expensive than buying them when you need enough for 30-50 kids. Especially when some of those kids are with adults who will NOT supervise their use and some of the props need to be replaced each year :( Others can be purchased inexpensively in bulk. 1) Overture: During this music, I explain what we will be doing, show the basic foot positions of ballet (which I don't expect the kids to master, but it's fun) and demonstrate several of the simple steps that we'll be doing. 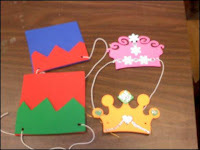 2) March: The girls wear princess crowns and the boys wear soldier hats as they march, jump (echappe), walk in circles, march into the middle and out and gallop (chasse). The girls' crowns are from a foam kit you can buy. JR and I had lots of fun fancying them up with glitter and foam shapes--the glitter isn't showing well here. The boys' soldier hats are made from foam pieces--I just cut and glued them as best as I could. 3)The Story of "Clara's Dream"
I don't use music during this. I tell the story of Clara's receiving the Nutcracker, of its breaking, of Clara's putting the Nutcracker to bed under the Christmas tree, then tiptoeing downstairs to make sure it's okay. 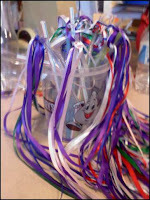 The kids get to pretend that they are the mice--squeaking and wiggling their whiskers. 4)The Christmas Tree and The Mouse King: This is made from felt, backed with cardboard, and suspended from the ceiling via one of my favorite things--clear fishing line. The tree is folded down part way, but when I tell the kids about the clock striking midnight, I pull on the fishing line and the tree rises and unfolds, "growing". Then I enact the battle of the Nutcracker and the Mouse King, Clara's throwing her shoe, and the transformation of the Nutcracker into the Prince. 5)Tea: The first dance is the Chinese dance. These are folded paper fans, secured at the bottom with shiny silver duct tape (you can get it in various colors as well, BTW). I have also bought fans like this and this from Oriental Trading, but they tear easily, so unless you are working with older kids, I'd stick with the paper kind. Incidentally, Oriental Trading has GREAT customer service, and issued me a credit when I complained about how bad the fans were! 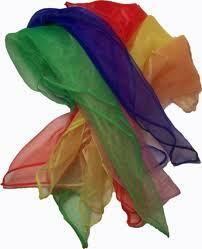 In the "Tea" dance we prance (cheval), walk on our tippy toes in a circle (bouree), and jump in and out (echappe). 6)Trepak: This is the Russian music and I let the kids free dance, something that a lot of them seldom EVER get to do, alas & alack. I wanted noisemakers and saw bells on popsicle sticks glued into star shapes on a craft site(4th of July project). 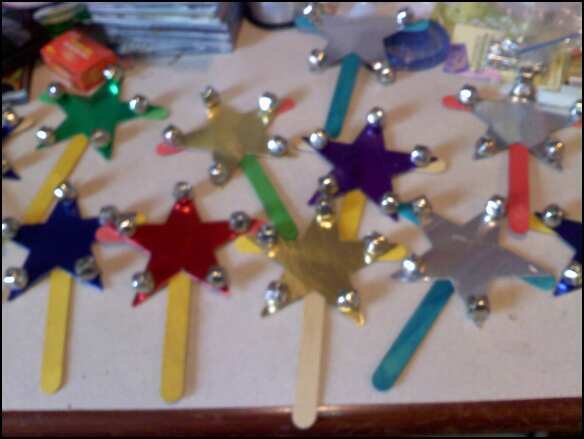 Cardboard stars are sturdier, but if you want to use these longterm I recommend finding a way to wire the bells onto the stars, something I really, really need to do as they often come loose and I'm tired of gluing them back. 7)Coffee: This is one of my favorite dances and gives me a chance to get the kids to try doing something SLOWLY. These juggling scarves are a little more expensive than some of the other props since I've had to buy 36 of them, again from Oriental Trading, but I use them often during the year, so they are well worth it. BTW, Johnette Downing's album "The Second Line" is pretty much ALL scarf songs, and it's great music! When we use the scarves I suggest that the kids try walking slowly with the scarves, that they try waving them in the air, dragging them on the ground,etc. I have them finish curled up on the ground with their scarf! 8)Mother Ginger and Her Children: Another excuse for a noisy free dance. 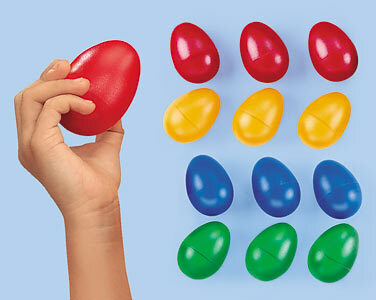 This time the props are egg shakers. You could make these on your own, but I'd recommend buying the nice sturdy ones sold by Oriental Trading or Lakeshore Learning. 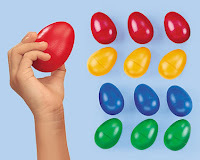 Again, these are a more expensive prop, but you can use them year round--start with Nancy Stewart's "Egg Shaking" song. The music starts fast, slows down and then gets fast again--great for galloping and jumping and arm swinging. 9) Dance of the Sugar Plum Fairy: Even people who have never heard of Tchaikovsky know this music, it's been used everywhere! 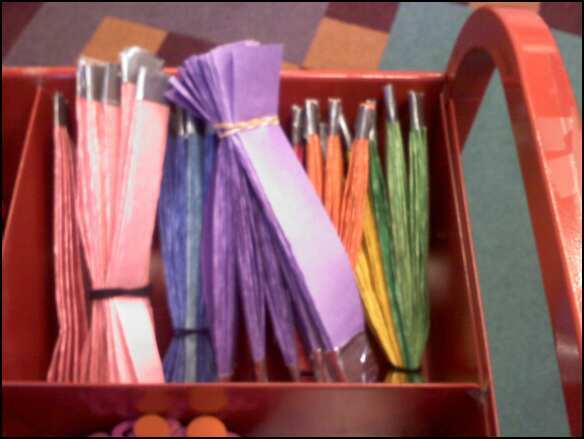 You can buy commercial ribbon streamers, but they're expensive. So you are looking at my sub--ordinary straws with a hole punched at one end, threaded with several streamers made of the narrow silk ribbon you can get 2 or 3 for a dollar at the craft stores. The kids move the ribbons up, down, to the left and to the right and shake them for "snow". They circle with the ribbons. At the end, during the fast music, they gallop & shake the ribbons as hard as they can for lots of snow! 10)FINALE: I play the last few minutes of the finale, and teach the boys how to make a bow & the girls how to make a curtsey.Well done! I LOVE this idea! I'll have to start accumulating these things to do for December 2012!